The Cumberland & Dumfriesshire Farmers Mart P.L.C. 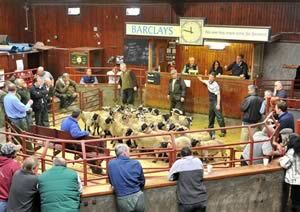 had forward 62 prime cattle, 31 over thirty month cattle, 3,091 prime lambs and 5,883 cast ewes & rams at their weekly sale at Longtown on Thursday 15th July, 2010. Clean cattle sold to a top of 183.5p for a Limousin heifer from R.M. & P. Armstrong, Slealands. Blonde d’Aquitaine bullocks to 167.5p (£1,140) from J.C. & D. Nicholson, The Gill; Limousin 167.5p (£1,214) J.F. & I. Armstrong, Nether Onsett. A larger show of OTM cattle met a brisk trade with well fleshed cows every bit as dear. Top price of 115.5p for a Limousin steer from C.A. Grieve & Sons, Snab Farm. Limousin cows to 112.5p from W.H. & D.A. Gass, Nunscleugh, others 111.5p Nunscleugh, 110.5p Bleatarn, 97.5p Blindhillbush, 95.5p Ifferdale; Charolais 109.5p Skipness; Hereford 105.5p Barnglieshead; Angus 103.5p, 101.5p, 99.5p, 95.5p Ifferdale; British Blue 101.5p Snab, 98.5p Miller Hill, 91.5p Burnside. The 3,091 prime lambs were the largest show of the season. An extended ring of buyers were in attendance, culminating in an average of 164.1p per kilo. Top price of 199p per kilo for Texels from Messrs Tinning, Mossband House and to £93.50 per head for Texels from A.R. Bell, Kirkton, others £87.50 Rhoin; Suffolk £79.80 Ormiston, £78.80 Winterhope, £76.20 Wallend; Greyface £72.50 Johnstone Bank, £69.80 Albie Rigg, £68.80 Crawfordjohn Mill; Charollais £70.20 Hallburn, £67.80 Colter Coates; Cheviot Mule £69.80 Hermitage; Half Bred £67.80 High Moat, £67.20 Earlside; Blackface £64.20 Penpeugh, £61.80 Crawfordjohn Mill; Bleu d’Maine £62.80 Middle Farm. The 340 light weight lambs sold to a top of £65.80 for Texels from Castslackburn and Mossband House; Suffolk £63.50 Colter Coates, £58.80 Butterdales; Charollais £57.80 Kirkend; Greyface £55.80 Grainhead; Herdwick £54.80 Red House; Blackface £52.80 Coytre. An exceptionally large show of 5,883 cast ewes and rams for this time of year saw a full ring of buyers in attendance, resulting in a good trade for all classes. Hill ewes were slightly easier on the week, but good meated selling ewes were readily wanted. Top price achieved was £148.50 for heavy Texel ewes from Cooilingel, others £138.50 Seavers; Suffolk £134.50 Bardhnaclaven, £122.50 Stackbraes; Charollais £118.50 Pates Hill, £98.50 Coytre; Leicester £113.50 Whinfield, £108.50 West Farm; North Country Cheviot £103.50, £95.50 Bardnaclaven, £90.50 Lesson Hall; Beltex £95 Waterside, £90.50 Winterhope; Bleu d’Maine £94.50 Golden Lane, £82.50 Ballinliss; Half Bred £94.50 Alton Farm, £91.50 Smerral Farm; Greyface £90 Hermitage, £80.50 West Hills; Cheviot Mule £85.50 Clackmae, £79.50 Whitstonehill; Zwartbles £70.50 Treconer; Wensleydale £70.50 Red House; Ryeland £64.50 Golden Lane; Vendeen £64.50, £57.50 Kirkwood Mains; Easycare £50.50 Kersheugh. Hill ewes to £84.50 for Cheviots from Ballygroggan, £75.50 Upper Cleuch; Blackface £62.50 Golden Lane, £61.50 Haithwaite; Jacob £60.50 Golden Lane, £58.50 Skelfhill; Beulah £59.50 Golden Lane; Swaledale £56.50 Penpeugh and Nunscleugh, £52.50 Stackbraes; Clun £55.50 Jury Park; Kendal Rough £47.50 Roosecote; Shetland £41.50 Barnakill; Herdwick £41.50 Mossband House, £39.50 Farmers Close; Welsh Mountain £32 Linton House. Rams to £136.50 for Texels from Newbigging, £132.50 Coytre; Bleu d’Maine £128.50 Newbigging, £108.50 Stackbraes; Suffolk £118.50 Hillhead, £117 Coytre; Charollais £115.50 Golden Lane; Leicester £108.50 Hightown, £78.50 Newbiggin Walls; Easycare £89.50 Kersheugh; Beltex £88.50 Kirkland Green, £79.50 Flex; Lleyn £88.50 Whitcastles, £76.50 Linton House; Hill Cheviot £86.50 Bordersyke, £78.50 Newbigging; Blackface £62.50 Tone Hall, £59.50 Moorhouse; Swaledale £62.50 Wolf Hills.